The New Year is the perfect time to refresh your company apparel! Making sure your current company apparel is fashion-forward and on-trend has two important benefits. First, your employees will appreciate apparel that’s both comfortable to work in and can be worn outside of the workplace. The more they want to wear your branded apparel, the more often your brand has a chance to be seen! Second, having attractive apparel will reflect well on your business as whole; proving to potential clientele that you are in-tune with current trends and customer needs and that you treat your employees well. 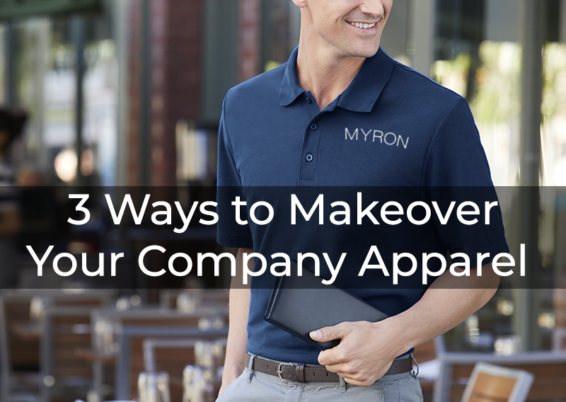 If you think it’s time to makeover your company apparel, then we have three tips for how to do just that! No one enjoys wearing itchy, stiff clothing, and the type of fabric can make apparel look outdated. There are tons of options available now when it comes to fabric that looks great and feels comfy and breathable. Consider a sportswear-inspired polyester blend or a wrinkle-resistant cotton/poly blend. Many companies will make the mistake of buying boxy shirts with the intention of appealing to everyone. In reality, this approach appeals to few. Form-flattering cuts are stylish right now, so you may want to look for slimmer-cut apparel. Buying women’s cuts in addition to men’s/unisex cuts is a big plus too! Don’t be afraid to stray from the typical left-chest-embroidered shirts. Most Myron apparel has multiple locations for imprints, so explore the different options to find what looks best! You can also explore different types of promotional apparel beyond polos and T-shirts. “Athleisure” is popular now, and hats always make a great inclusion to the company wardrobe. Let Myron help you find the best products and designs to makeover your company’s apparel! With our competitive prices and 100% satisfaction guarantee, we promise you’ll love your company’s new look.